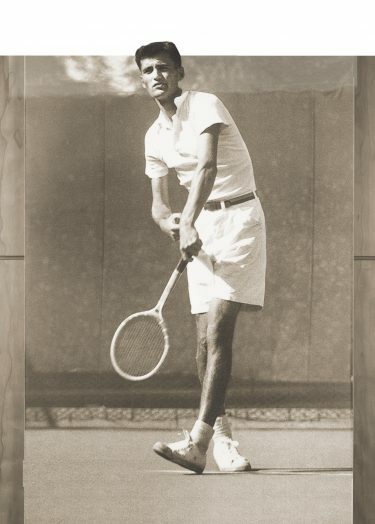 Walk into the Nordstrom Tennis Center on the UW campus, and you’ll come face to face with a photo of one of the UW’s few NCAA tennis champions. That’s Jim Brink, an Army Air Corps veteran from World War II, who, with Fred Fisher, ’49, won the 1949 men’s national doubles championship—the UW’s only national title in men’s doubles. Brink, a star tennis player at Seattle’s Roosevelt High School, put down his racket to serve in World War II. But when the war ended, he returned to Seattle, enrolled at the UW, joined Phi Gamma Delta and shined once again on the tennis court. After college, Brink, ’49, went on to play against some of the greatest players in tennis history—Pancho Gonzales and Jack Kramer to name just a few. But professional tennis then was nothing like it is today, so Brink needed a day job in business to support his family. Despite all of his success on the tennis court, you won’t find a shrine to his exploits at his home in suburban Portland. And now, we take a moment to pay tribute to one of the UW’s greatest athletes. Brink, a member of the Husky Hall of Fame, died March 12 at the age of 91. It’s a big net loss for all of us.